AFC Fylde’s latest signing Laurence Maguire could not hide his delight after making the perfect start to his Coasters career. 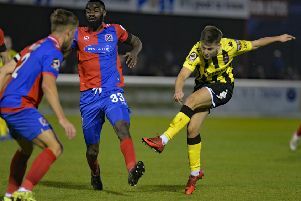 The 20-year-old Chesterfield defender put pen to paper on a loan deal with Dave Challinor’s title-chasers just 24 hours before making his debut in the crucial 3-1 victory away to Brackley Town on Saturday. Fylde have been plagued with injuries at the back in recent weeks and Maguire was thrown straight into the starting line-up as the Coasters extended their lead at the top of the National League North to a healthy 10 points. Maguire said: “I’m delighted to be here and three points on my debut is all I could have asked for. I really enjoyed the game too, so it has been a good start so far. “I expected to get plenty of long balls into the box and to have their strikers backing in trying to unsettle us, and that is exactly what we got. “So to get maximum points from a tough game was massive for us. Our third goal was vitally important. “A two-goal lead in football is massive because you can settle down and try and play. “It helped relieve the pressure on us after they had pulled one back a minute after we got our second goal. “I trained for a couple of days with the squad towards the end of the week, so it was no problem going into the team. The youngster, who has made 11 appearances in League One this season for the Spireites, lined up alongside Steve Williams at the back and admits the experienced defender helped him through the game. Maguire, brother of Hull City player Harry, said of his new team-mate: “Willo is very experienced and he really helped me in the lead-up to the game in training, and to have him next to me during the game made a big difference for me. “He was constantly talking to me and helping me through the game. The loan is initially for a month but it could be extended if all parties are in agreement. Fylde are at home to Tamworth on Saturday. The Lambs dropped to eighth place after losing to AFC Telford United at the weekend.